Orust is Sweden’s third largest island, located sixty kilometres north of Gothenburg. The tradition of building boats dates back to Viking times, and the term ‘Orust quality’ is known and respected all over the world. Even if the number of manufactured boats has decreased, the sector is still prominent with activities in the field of boating accessories, maintenance, repairs, storage etc. 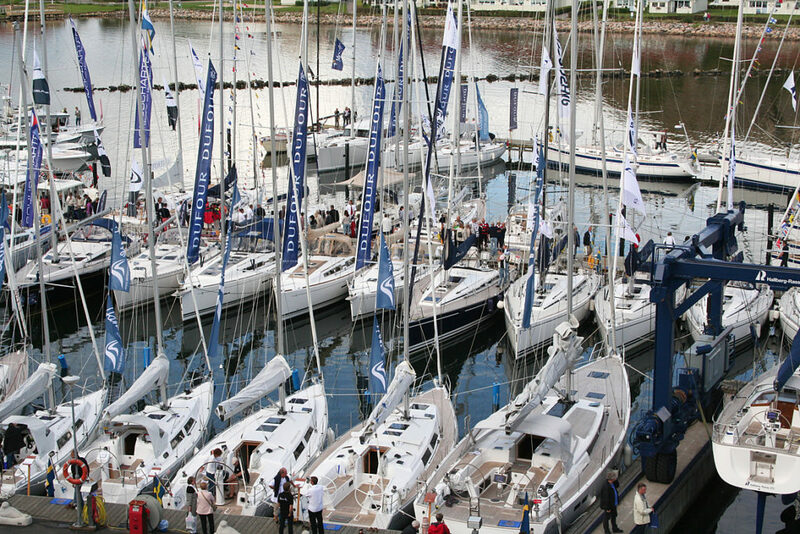 Orust’s dominant position in the industry manifests itself each year in August, when the floating boat fair Öppna Varv takes place. Trade and industry are small-scale, with many entrepreneurs. There are 2,000 businesses on Orust, and most of them have one to ten employees. Several companies have leading positions within their respective specialisations. Examples are Marinfloc, that manufacture cleaning installations for watercraft, Conscriptor, that provide medical records via the internet, and Swedeponic, that cultivate fresh herbs and salads in pots. Hallberg-Rassy, sailing boats that are known for their Orust quality. Marinfloc, internationally leading in the development of systems and the manufacturing of cleaning installations for watercraft, that prevent the emission of pollutants. More than 2,000 seamen from all over the world have obtained technical training by Marinfloc, so that they could service these installations themselves. Sweden Pelagic, one of the country’s largest fish processing businesses. Here, herring is filleted and subsequently shipped on to be used in tasty preserves. Scanfjord, Sweden’s largest producer of cultivated fresh mussels. Nordholms Industriinstallationer. Highly qualified welding expertise that is purchased by nuclear power plants and industries that produce for instance medicine, food stuffs and petrochemical products, both in Sweden as well as abroad. Conscriptor represents a new, growing sector that bases its activities on compiling medical records via the internet. The discount department store Göksäter is Orust’s most prominent attraction for visitors, and welcomes more than 800,000 customers per year. Olssons in Ellös. One of Orust’s largest E-businesses and one of Sweden’s leading suppliers of spare parts for tractors and construction machinery. There are five industrial estates spread out evenly over Orust. They are located in Henån, Svanesund, Varekil, Mollösund and Ellös. The latter two are close to the sea. In Varekil and Ellös, plots are available for small-scale industrial applications, office spaces and other activities. Many private real estate owners offer spaces that can be used for different purposes. Several of them also have premises in stunning settings. The municipality and these property owners cooperate willingly in order to find the right solution for businesses that need premises and office space. Tourism is a growing sector, and as one of four municipalities, Orust participates in the tourist agency Södra Bohuslän Turism, which is owned by trade and industry. Businesses and the four municipalities work closely together. Orustkonferens is a business network with six conference and hotel centres on the island as its members. The water quality and a clean sea are prerequisite for living and working here. That is the reason why Orust takes part in the network ‘8 fjordar’ that is active for making the water cleaner, the fishing better, etc. An early-stage cooperation project is called Orust Kretsloppsakademi, and consists of individuals who work for a healthy and durable community. The academy’s objective is to make Orust climate neutral by 2020. Trade and Industry is a meeting place for trade and industry and the municipality, where questions and ideas are brought to the table in order to develop the cooperation and drive Orust forwards. Orust has 15,000 inhabitants and is Sweden’s most densely built-up back-country. In the summer, the population more than triples. The large island to the west offers lots of different housing environments with rented and co-operative apartments, and freehold properties. Rented apartments are available in all larger towns, and also out on the traffic-free islands of Käringön and Härmanö. The municipality is developing several local plans and residential areas on the entire island. Connections with the island are good. It takes only around 15 minutes to reach the E6 from the island’s northern- or southernmost part. From the central town of Henån to the nearest domestic airport takes about 45 minutes. You can get to an international flight in approximately one hour. At the end of 2013, work is started on the reconstruction of road 160 between Skåpesundsbron and Varekil. The road will be refurbished with a cycle path. Since the summer of 2013, the ferry to Käringön and Gullholmen/Härmanö departs from a new terminal in Tuvesvik. Boats have characterised Orust since long before Viking times, and this culture is still present in many settings, historic sites, names and other contexts. Dolmen, stone circles, hill forts give testimony to how man settled on the island 11,000 years ago. Orust is the island of events. Above all during summer, The whole municipality of Orust is full of entertainment, exhibitions, organised hikes and other public happenings. Many of Sweden’s best musicians come here each year to perform for an enthusiastic crowd in the extremely special settings, on many podia. The cultural centre the Kajutan in Henån annually has more than 100 events and exhibitions. The fact that there are active inhabitants, societies and adult education associations is very important for culture and leisure on the island. They are industrious and take the initiative for many activities. For many of the finest leisure activities, organisers aren’t needed. Swimming, boating, the nature with its many hiking opportunities, and the traditional fishermen’s communities are always there.